I love Easter. I love that we are celebrating our main reason for living - Jesus. I love that it's in spring and everything is coming alive. I love the colors and the joy and the celebration. I love the traditions. Hollis had an Easter egg hunt at school Friday. She had so much fun. Our family heads up the Ordinance committee at church which means one of the things we do is the Lord's supper. We had a big Good Friday service and we had to set it up. We got there at 4:30 and were there until it was over and cleaned up which was late. It's a long night especially having Will Holden with us and trying to keep him busy but the kids are such good helpers and I love that it gives them a way to learn serving. They LOVE filling up the juice cups! 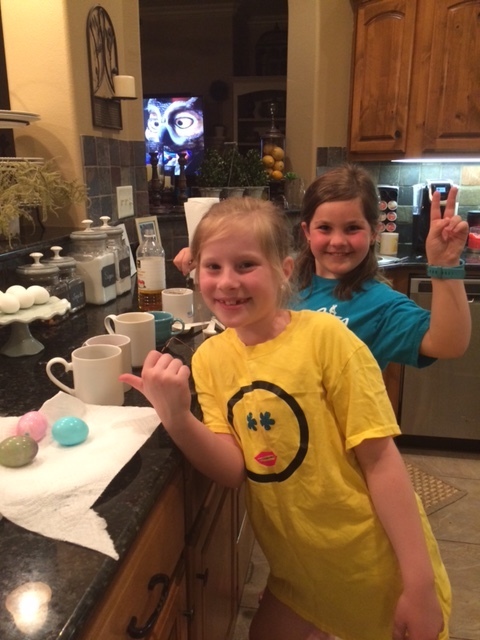 Harper went home with Sarah Kate for a sleepover Friday night. They had the best time! Saturday we went over to our friends' house for an Easter egg hunt. It was such a beautiful day. They live out in the country and it's just a gorgeous setting. It was almost 80 and the water was warm enough to swim so the kids had a great time swimming. I don't know that we have ever swam so early but it just seemed like a great kick off to late spring/summer! This was the first year for Will Holden to really hunt eggs. He had to stop and open each egg and sample the prize before he would move on for another one. The Easter bunny showed up Sunday morning! We had to help with a Baptism in the early service so we had to leave super early for church. We had a wonderful service. It was dark and pouring rain all morning but our church was full and we had around 25 people accept Jesus as their savior! If that isn't a wonderful Easter - I don't know what is!!! We had lunch over at Laurie and Steve's and then ended up staying most of the afternoon. We had such a great time. We are six months away from our Disney trip. It just happened that THIS MORNING at 6 a.m. was when we needed to book our dining plans. Thank goodness we had a Disney planner helping us because there is no way I could have worked in booking our dinners in the middle of getting everyone ready for church. ha! We watched videos on different parks and rides to get excited for our trip! Will Holden's favorite person is Steve. Eight years ago, I took Harper over to meet Sarah Kate once her quarantine from people was over. I found this picture last week and Laurie and I decided to recreate it. We were laughing so hard trying to pick these girls up. We can't wait to do it again when they are 18. ha ha ha! 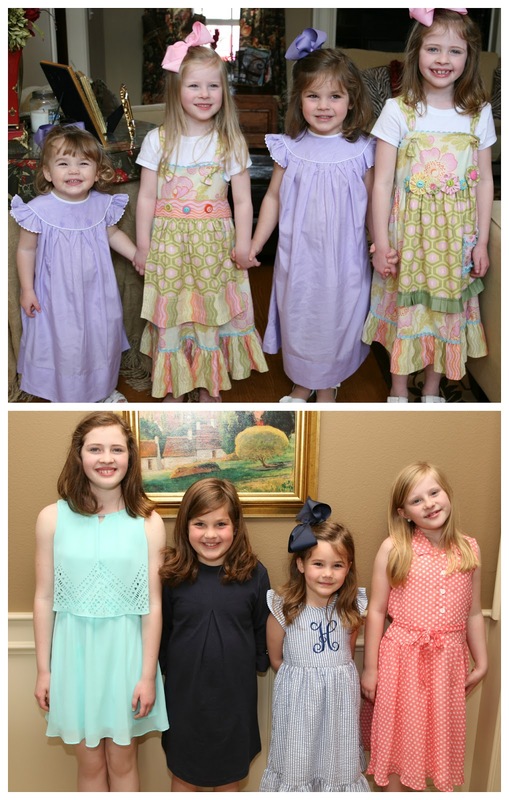 Here's another picture of our girls growing up. Easter 2013 and Easter 2017. Emily is basically a teenager now. And we are down to only one bow in the group. Harper actually wanted to wear one to church but it came out by lunch. I had to run to the grocery store later in the afternoon and the day finally caught up with this boy. We had a busy weekend and he was TIRED. Easter weekend was full of my favorite things and I'm so thankful!